The S.M.A.R.T. 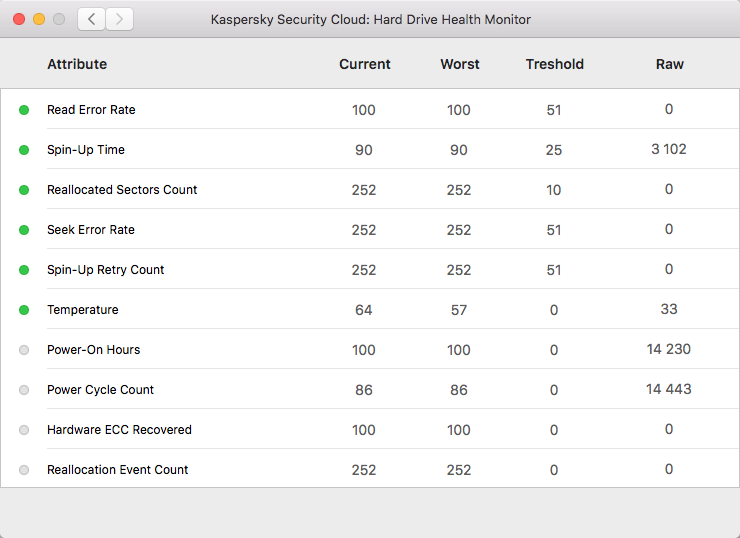 diagnostics technology is used in Kaspersky Security Cloud for Mac to track and predict hard drive errors. 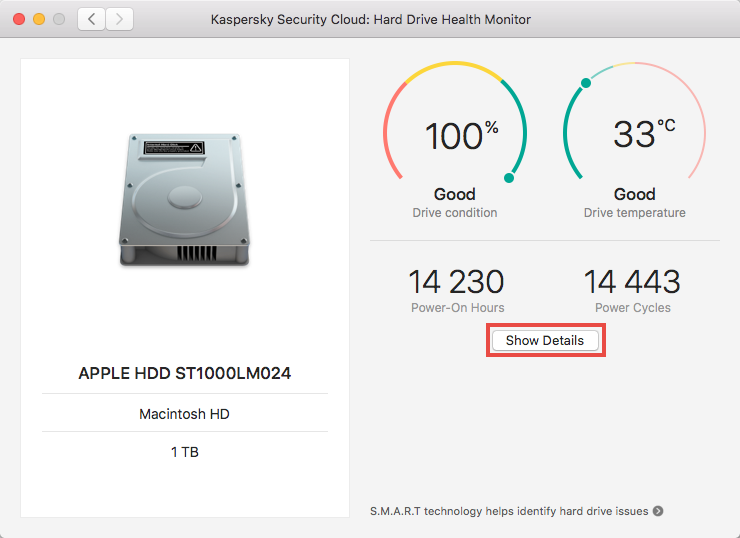 A component in Kaspersky Security Cloud for Mac analyzes the condition of the hard drive by its S.M.A.R.T. parameters. The parameters are described below. Hard drive health check is performed automatically once a week. If necessary, you can also run it manually. When the condition of your hard drive worsens, the application will show you a warning so that you can backup your files and avoid data loss. If you receive this message during the warranty period of your computer or hard drive, contact the seller to have your hard drive replaced. If the warranty has already elapsed, contact a computer or hard drive repair center once you have backed up your files. 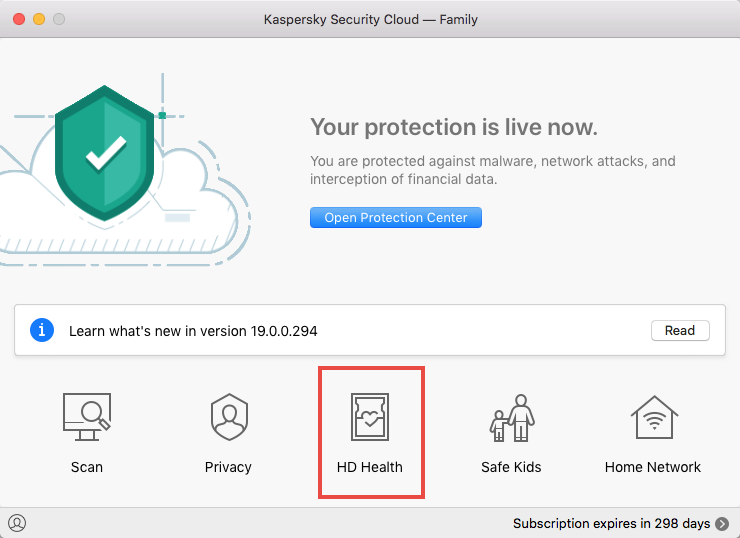 In the main window of Kaspersky Security Cloud for Mac, click HD Health. The information about the condition of your hard drive will appear in the window. S.M.A.R.T. parameters are used for analyzing hard drive condition and performance. Each parameter has a threshold value against which the current value is compared. The frequency of errors during disk read operations. Average time of spinup from 0 spins per minute to the working speed. Number of reallocated sectors. A sector is marked as reallocated when a read, write or verification error occurs on the disk. The data is moved to a special backup (spare area). When a large number of sectors are reallocated, the data reading speed drops sharply (up to 10% or more). The rate of seek errors of the magnetic heads. Seek errors will arise there if is a partial failure in the mechanical positioning system, damage to a servo, or thermal widening of the hard disk. The number of attempts to reach the fully operational disk spin speed. The count of hours in power-on state. The count of full hard disk power on/off cycles. Number of errors detected and fixed by the ECC memory of the drive. Number of sector reallocation events. The number of unstable sectors for reallocation to the disk’s spare area. The number of unstable sectors detected when testing the disk offline. A count of errors that occurred when transferring data via the drive's cache. The count of sectors that were declared as unstable for reallocation for the whole lifecycle of the drive. If a sector is declared a unstable for a second time, the value of the attribute will also increase. The count of operations that were canceled because their execution time exceeded the drive timeout period. Distance the disk has shifted relative to the spindle. Remaining lifetime of the hard drive in percents. The average number of erase cycles. Number of writes to the NAND memory (Not-And). Frequency of software read errors. Total volume of information on the disk. Total volume of information read from the disk. Maximum possible number of disk erase cycles. Total number of disk erase cycles. The amount of spare memory remaining on the disk. A parameter that could not be determined. Your hard drive does not support S.M.A.R.T. technology. The S.M.A.R.T. feature has been disabled on your hard drive. Kaspersky Security Cloud for Mac does not support the USB controller disk type. Kaspersky Security Cloud for Mac does not support the connected drive type. The hard drive is disconnected.